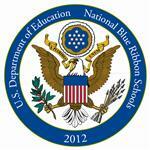 The 2012 National Blue Ribbon School Award from the U.S. Department of Education was awarded to Arlington Traditional School. ATS is one of 269 Schools nationwide to receive the honor. ATS received this award because of its overall academic excellence. Our mission is to provide for all Arlington Traditional School students a structured environment where every child is engaged in learning in a responsible and productive way so that each student will be challenged to reach his or her potential, be a life-long learner, and contribute as a caring member of our diverse, changing world.